A Los Angeles police officer and his orc partner must prevent a magic wand from falling into the hands of an evil elf that wants to summon the Dark Lord back to earth. If you've ever wondered what it would be like if "The Lord of the Rings" was actually a modern day crime thriller, look no further than "Bright." The film is directed by David Ayer, who is known for directing movies like "End of Watch," "Fury," and more recently, "Suicide Squad." It is written by Max Landis, who besides being the son of famed director Jon Landis has written screenplays for "Chronicle," "American Ultra," and "Victor Frankenstein." "Bright" stars Will Smith as Los Angeles police officer Daryl Ward, and Joel Edgerton as his orc partner Nick Jakoby. This original story takes place in a universe where orcs, centaurs, elves, fairies, and humans have all lived on earth together for the entirety of its history. Elves are wealthy and high class and seem to run the world. Orcs, on the other hand, are often discriminated against and are seen as little more than criminals and thugs. Nick is the first orc on the police force and none of the other cops are happy about him being there, including his partner Daryl. One day while on patrol, the two discover a magic wand, and though it can only be wielded by a 'Bright' (a magic user), everyone wants to get their hands on this mystical item which they see as something that will make their dreams come true. Now, Daryl and Nick have to keep it out of the wrong hands and away from an evil elf named Leilah, played by Noomi Rapace, who wants to summon an ancient Dark Lord back to earth for some reason. If you're a long time reader of our movie reviews, you'll know we are huge fans of fantasy films. We are also fans of original works that are not sequels, prequels, reboots, reimaginings, etc. "Bright" is both of these things, and its universe is an interesting one. Unfortunately, it doesn't seem very well thought out. This is a world where elves, orcs, centaurs, and humans have lived together since the beginning of time. Despite this, the movie "Shrek" still exists, and considering how orcs are viewed by society in this alternate timeline, that film would be more of a hard-hitting social commentary than a pop-culture laden comedy. Also, the battle at the Alamo exists as well, which make us wonder if all major historical events are exactly the same in this universe as well as our own. Were any presidents ever elves? What was the Civil War like? How about westward expansion? Did Christopher Columbus slaughter and displace centaurs instead of Native Americans? What are the native continents of elves, orcs, and centaurs? Another thing we noticed it the word "fairytale" is thrown around a lot to refer to a fantasy, though fairies are very real things and are viewed as pests by most humans. Maybe we're thinking about it a bit too much, but the point is, it's something we noticed instantly, which means writer Max Landis appears to be more concerned with providing pop-culture markers for viewers instead of concentrating on making a well-written script. The biggest problem in this film is not the weird universe and its unclear history, but the overall poor pacing and disjointed narrative. It seems to borrow part of its storyline from "Zootopia." Nick is a stand-in for Judy Hopps, but unlike that Oscar-winning animated feature, "Bright" fails to deliver any meaningful social commentary or convincing character arcs. All of these things are set up and meant to parallel racism and prejudice in our own society, but not enough is done to really elaborate on these ideas. Those behind the scenes seem to use racism and prejudice as a point of contention between Daryl and his partner Nick and little else. 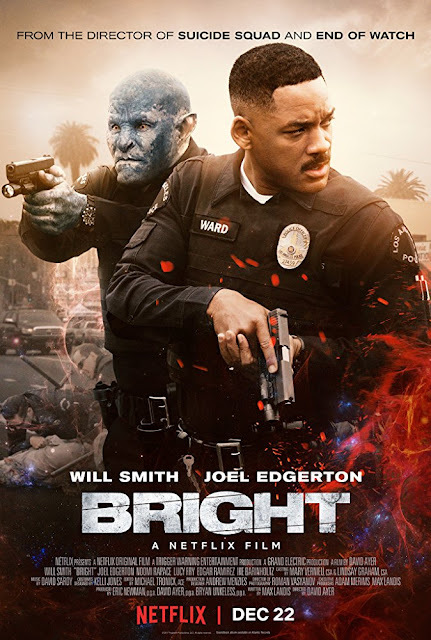 At its core, "Bright" is about two characters learning to work together while chasing a magic MacGuffin around an alternate Los Angeles while fending off an underdeveloped villain we don't care about who has a convoluted plan that feels meaningless. Sure, there are some cool visuals from time to time, but a sometimes entertaining spectacle is not a substitute for a solid story. For us, the slow pacing, odd tone, goofy dialogue, over the top acting, and messy story take away from what could have been a really great, meaningful, enjoyable flick. There are a lot of interesting ideas here, but they aren't fully realized in a significant way. Of course, it is free on Netflix, so there isn't much risk in seeing it for yourself if you are already a subscriber to that service.